Ok, so what about me and why should you be spending your valuable time reading what I have to say about how your eyes see color? Well, other than that I think the evidence will show that what I have covered on this web site is indeed valid, it does represent over thirty years of professional work by a number of colleagues and myself. I have a doctorate in physics from the University of Massachusetts (Amherst) where I did experimental work on atomic collisions (Thesis: Metastable Hydrogen Atom Collision Processes). Subsequently, I worked for some five years or so as a postdoctoral fellow and then as a research associate at the University of Western Ontario investigating both the anatomical structure of the retina and damage mechanisms of laser irradiation in the eye. That work contributed in a small way to the current routine clinical treatment by ophthalmologists of retinal problems using lasers. That’s also where I got the basic idea of the cone spectrometer model as a consequence of using a physicist’s perspective in studying the eye and vision. Following that work, I took an assistant professorship in the physics department at The Pennsylvania State University (York campus) for six years. My research there included the study of arterial branching in the retina and the work on the separation of rod and cone perception. 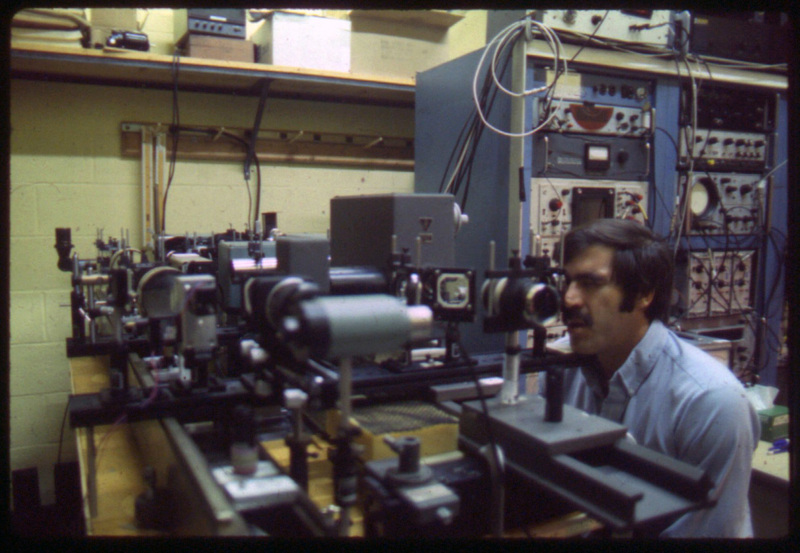 The photograph below shows me at the business end of the moving slit apparatus we put together in my lab at Penn State during that period. I was awarded tenure at Penn State but I subsequently decided to leave to work in industry. After six years in the deserts of New Mexico as Chief Optical Engineer working for Pacific Sierra Research on some optical physics projects that I still can’t talk about, I went to work for COLSA Corporation in Huntsville, AL as a Senior Scientist where I’ve been for the last (nearly) twenty years. My day job involves playing with large toys (some of the biggest computers on the planet) and no; we don’t use them for investigating color vision. Instead, they are used for computational fluid dynamics calculations investigating hypersonic flight. I have had the great privilege over the years of working with some very good and very smart people on a number of different projects. As you might expect, these very competent colleagues are not necessarily in the mainstream of vision research on the standard trichromatic model. Simply put, most of those supporting the traditional model have not been very welcoming of efforts to point out the need for a new approach to the understanding of color vision. Hopefully, what I have put together here on this web site and in my book, Cone Shape & Color Vision, will help in starting some needed discussion of just how color vision really works.